I am not a zoologist, but I did grow up with books, movies, and cartoons anthropomorphizing animals to the point where I worry about my dog’s self-esteem. 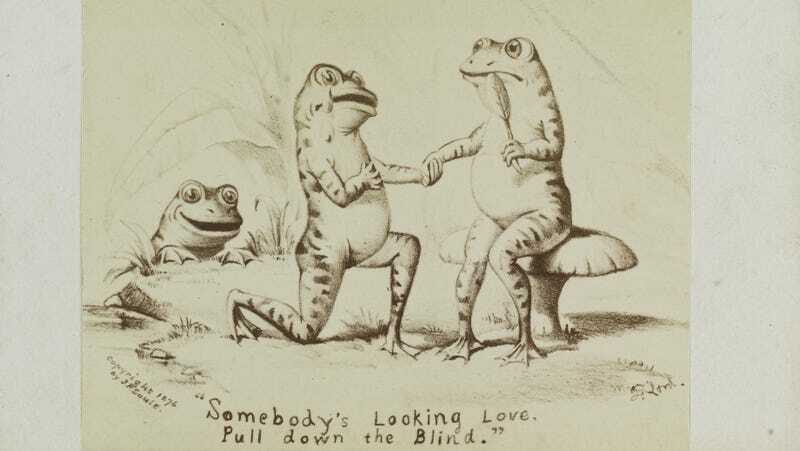 It’s with this authority that I declare the tender first days of a new romantic relationship between nearly extinct frogs probably full of lingering kisses, shy gazes, and tentatively passionate introductory boning. And if any frog deserves a little action, it’s Romeo, previously called the “world’s loneliest frog,” as experts believed he was the last remaining Sehuencas water frog. But hark! Researchers have discovered his fair Juliet in a remote Bolivian cloud forest. The news item doesn’t say she’d been locked in a cloud tower by a sorceress that didn’t get invited to her first birthday party, but it also doesn’t say she hadn’t been. But now she’s freed of her misty prison, and once the two were cleared of communicable diseases they had their fairy tale first date in January. It went well! While Romeo is a little inexperienced in the art of love, he’s working on it. According to the BBC “there have been a few brief sexual encounters” though Romeo is having a little trouble getting in the “right position for mating.” Listen frogs, pop culture love stories make us believe that if it’s right, there’s gonna be lightning bolts right off the bat, but sometimes in a new relationship, it takes a bit to figure what will get the job done. The key is communication; don’t get in your heads and be weird, just talk it out. If Frog and Toad can make it work all these years, y’all are going to be golden, and there’s really nothing cuter than two amphibians in love on a tandem bicycle.